A Stryker vehicle commander interacts in real time with a soldier avatar that is participating remotely from a collective trainer. 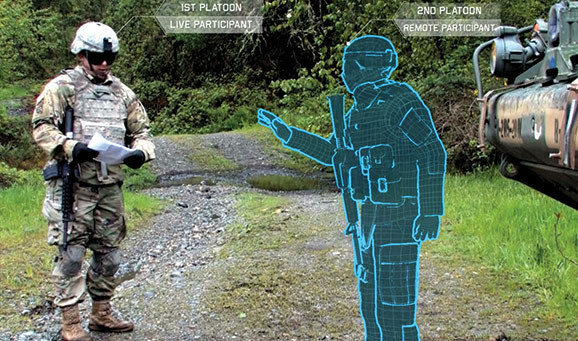 The U.S. Army Research Laboratory, University of Southern California Institute for Creative Technologies, Combined Arms Center-Training and Program Executive Office for Simulation, Training and Instrumentation are developing the Synthetic Training Environment, which will link augmented reality with live training. Information-gathering drones swarm the air as unmanned Army vehicles push just ahead of infantry soldiers into a mega-city overflowing with people, vehicles and high-rise buildings. Army cyber warriors fight a silent battle for the city’s internet of things while an unmanned warship shoots down an aircraft, which explodes in the air, creating a massive fireball and a barrage of fragments that plummet to the ground. Meanwhile, the first artillery crew to the battle is trading targeting and friendly forces information with Air Force bombers and Navy gunners. The technologies in this future multi-domain battle scenario may seem far-fetched, but the Army’s primary science and technology arm, the U.S. Army Research, Development and Engineering Command (RDECOM), is developing many of them now. As the link between Army readiness today and for the future force, RDECOM is overhauling how it does the business of science and technology (S&T) to posture itself to make a reality of the six modernization priorities listed by Acting Secretary of the Army Ryan McCarthy and Army Chief of Staff Gen. Mark Milley: long-range precision fires, Future Vertical Lift (FVL), the Next-Generation Combat Vehicle (NGCV), air and missile defense, the network and soldier lethality. The goal of the plan’s four lines of effort is to focus the 24,000-strong command more tightly on the capabilities McCarthy and Milley have made their top priorities while maintaining the balance it needs to make the new discoveries and develop the new technologies that will become the capabilities the future force needs to maintain dominance. The lines of effort are: integrated technology development and engineering services; talent management and infrastructure; business process and resource optimization; and strategic communications. Leveraging the Campaign Plan, RDECOM - a major subordinate command of the U.S. Army Materiel Command - is optimizing its resources and collaborating across the Army community and with industry, academia and international partners to inform science and technology (S&T) requirements and execute research and technology that will deliver required capabilities for soldiers. RDECOM also works closely with its fellow Army S&T partners, the U.S. Army Space and Missile Defense Command, U.S. Army Medical Research and Materiel Command and the U.S. Army Engineer Research and Development Center to round out its portfolio. The integrated technology development and engineering services line of effort is intended to focus the command on identifying and inserting the right research and technology to fill gaps in current and future capabilities, as well as synchronizing RDECOM’s major S&T efforts with the chief of staff’s six modernization priorities. A number of RDECOM’s efforts that currently link directly to the Army’s priorities include robotics, artificial intelligence and autonomy. These technologies will enable the NGCV and FVL to perform both manned and unmanned operations, which will be required for the joint force in future air and ground domains. RDECOM also continues to develop technologies that provide assured position, navigation and timing and cyber and electronic warfare, critical components for both long-range precision fires and the network. Integration across its six research, development and engineering centers (RDECs) and the U.S. Army Research Laboratory (ARL) is an important component of this line of effort. For example, plans for FVL will leverage multiple areas of expertise within RDECOM, including engineers who can produce technology that allows platforms to perform complex navigation and a communication system that will operate in Anti-Axis Aerial Denial (A2AD) environments. Because of anticipated future threats, FVL platforms will also need active protection systems for maneuver and enhanced weapon systems for lethality. As stand-alone efforts, these systems are impressive, but maintaining the dominance the Army needs requires a fully integrated suite of capabilities that allow the soldier to focus on the mission, not switching back and forth between technologies. RDECOM plans to conduct technology demonstrations in 2018 that showcase robotics and autonomy, as well as efforts involving precision fires and network Command, Control, Communications and Intelligence. Also planned for FY18 is Cyber Quest, the annual competition conducted by the U.S. Army Cyber Center of Excellence’s Cyberspace Battle Lab, which will demonstrate cyberspace electromagnetic effects technologies being developed by the U.S. Army Communications-Electronics Research, Development and Engineering Center. Exercises in the Pacific theater that will start this spring and continue through FY19 will allow the new Multi-Domain Battle Task Force (MDTF) pilot program to evaluate specific technologies, including long range precision fires, precision navigation and timing, Intel, electronic warfare and cyberspace and additive manufacturing sustainment and logistics support. The MDTF was established to determine the requirements for a new military formation that will address the warfighting capability required in an A2AD environment. While the goal of these demonstrations is often an early assessment of how to apply the technology for military use, RDECOM works closely with the U.S. Army Training and Doctrine Command’s (TRADOC) Army Capabilities Integration Center to inform the requirements. TRADOC uses a “campaign of learning” approach to determine the doctrine, organization, training, materiel, leadership and education, personnel, facilities and policy implications of the capability. As technologies mature and transition into a program of record, the program manager uses the data from the demonstrations to chart a path for fielding the equipment and providing capability to the warfighter. The human capital team within the talent management and infrastructure line of effort is responsible for maintaining the right mix within RDECOM’s global workforce of almost 24,000 civilians, military personnel and contractors, including nearly 10,000 scientists and engineers. The human capital team is ramping up its efforts to attract and hire the next generation of technology leaders by visiting colleges and universities and holding conferences to recruit students interested in careers in science or engineering. To reach the right mix of people, the human capital team created a centralized process to determine which recruiting events the command should attend, as well as metrics for measuring the return on investment from those events. The team also initiated a speaker series aimed at keeping employees engaged, motivated and current in their fields, which should help employee retention. RDECOM leaders found that the different perspectives inherent in a more diverse workforce helps teams avoid group-think and becoming stale. The command mapped out visits to a number of historically black colleges and universities and minority institutions where Wins discussed career opportunities with students and partnership opportunities with the universities. The human capital team will also lead recruitment and outreach efforts at the Hispanic Engineer National Achievement Awards Conference, the Society of Women Engineers and the Becoming Everything You Are conference. As part of its recruitment effort, RDECOM also offers incentives, such as funding to pursue research opportunities, leadership development, educational and publication opportunities, as well as the opportunity to work in state-of-the-art labs around the world. These labs are vital to RDECOM since they are often where new ideas turn into next-generation technologies. Having the right facilities for new technological undertakings is also important to success. “The right number and mix of buildings is a moving target,” said Carl Boquist, RDECOM facilities, logistics and environmental director. For example, as part of efforts to hit that target, RDECOM is looking to build the Soldier and Squad Performance Research Institute, which will consolidate five laboratories into one and provide direct readiness to soldiers with projects that improve their cognitive, physiological, physical and nutritional performance. The lab will be part of the U.S. Army Natick Soldier Research, Development and Engineering Center in Massachusetts and build on research already completed. Operationalizing the command and delivering technology quickly, which Wins calls “speed of delivery,” requires collaboration and planning between the command and its research and development centers and labs because the command has personnel in more than 100 locations, in 11 countries and across five continents. By standardizing the command’s financial processes, the business process and resource optimization team is improving processes and identifying more efficient ways to conduct business. The business process and resource optimization team issued standardized budget guidance to maintain consistency and transparency across the command to the RDECs and ARL before the FY18 budgets were developed. Once the budgets were finalized, they were added into an internal RDECOM system, the Financial Integrated Reporting Environment (FIRE). One of the benefits of loading detailed budget information into FIRE is that it is automatically fed to the government financial accounting system so it can be extracted easily if a customer needs more detail or supporting information. The final step before the budgets were sent for approval was a robust review process. “With all of the changes that the team has added, we have a more transparent system that will allow us to troubleshoot financial challenges that arise,” said Paul Dunaway, RDECOM resource management director. Communication is important to RDECOM, which relies extensively on collaboration and partnerships to bring the best technology to soldiers. The command’s goal is to increase outreach efforts by attending more S&T and recruiting conferences, exercises and technology demonstrations to demonstrate RDECOM’s latest technologies and receive feedback from its stakeholders. These events offer opportunities to collaborate with industry and demonstrate how innovative technologies and experimental prototypes can transition to program executive offices and program managers for further development and fielding. By collaborating across the command and working with academic and industry partners, RDECOM maintains a steady stream of world-class technology. Going forward, these technologies will not only fill current and emerging capability gaps, but they will also mirror the modernization priorities set by the acting secretary of the Army and the Army chief of staff and enable RDECOM to continue developing and delivering capabilities that empower, unburden and protect the warfighter. “We will use our Campaign Plan as a guideline while we determine which technologies to focus on and how fast we can make them available for soldiers. Speed of delivery is key to our mission,” Wins said.